With more and more people becoming concerned with the environment, it makes perfect sense that solar power is becoming much more popular. Though they can be use on any type of building, there is plenty of proof to suggest they that work best with metal roofing than with any other types of roofing. Here are just a few reasons why steel roofing and solar panels are a match made in environmentally-friendly heaven. Steel buildings are already green buildings that do a great job of keeping the structures interior temperature regulated, so it’s a great fit with solar panels since they can both help each other. Heating and cooling uses up a lot of energy inside any space, so between a great roof and solar panels, you can greatly cut down on this energy use and the eventual cost that will hit your utility bills. Steel roofs are effectively able to reflect UV rays so they don’t overheat the structure, and also do a good job at keep cold air at bay in cooler temperatures. Solar panels tend to last for about 25 years, while most traditional asphalt shingle roofs only last for 15 or 20. 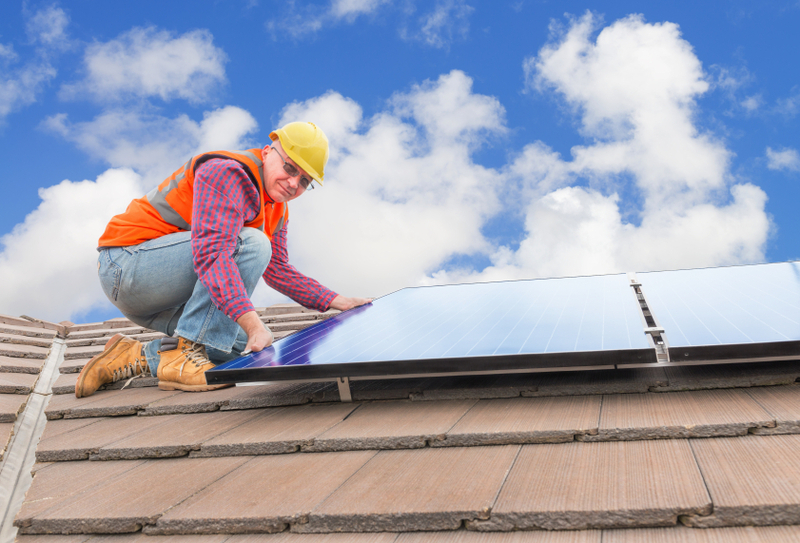 In many cases, the solar panels will far outlast the roof itself, and you’ll need to remove the panels in order to repair or replace your roof. This is something that can be time-consuming not to mention expensive. Steel roofs, on the other hand, will last much longer than the solar panels on average. With the right protective coatings and paints, your steel roof can last for upwards of 40 years. That way, you’re much more likely to have to replace your solar panels first, and your roof at a much later date. You won’t have to pay for the take down and reinstallation of your solar panels before it’s time for them to be replaced themselves. Solar panels are usually installed in a very particular way on roofs, but on steel roofs it’s that much easier due to the material and the way it lays down. Because the fasteners of your roof will be hidden underneath its panels, installing these solar “racks” will take much less time and labor to be completed on a garage or any kind of building. Because it can simply lock onto the seams present on most steel building roofs, there will be no need to drill down into the roof in order to keep it attached. That greatly reduces the risk for any eventual leaks or problems down the line with your roof. By adding solar panels to your structure, you’re showing that you have a commitment and concern for the environment and your impact on it. You do the same thing by having your structure be a steel building in the first place. These green structures are 100% recyclable, and there’s a good chance that the steel building kit you order will be made mostly from recycled steel from other commercial projects. The combination of your prefab steel building along with using solar panels to create your building’s energy will do plenty to reduce the entire structure’s impact on the environment around it.